Place the sugar in a pan with 100ml cold water. Slit the vanilla pod in half lengthways and add to the pan. Bring to the boil and simmer for 4 minutes to make a light sugar syrup. Mix the cornflour with 2 teaspoons of cold water to form a smooth paste. Stir the cornflour mixture into the sugar syrup and bring to the boil. Add the blueberries to the saucepan and simmer gently for 1 minute. Add the raspberries to the saucepan along with the kirsch. Gently mix, then remove from the heat and leave to cool. Remove the vanilla pod from the pan. 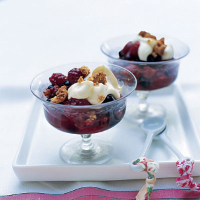 Serve the berries warm or at room temperature, topped with a generous spoonful of mascarpone and a couple of crushed amaretti biscuits. Serve with extra biscuits for dipping. These berries can be cooked the day before and gently reheated, or served at room temperature.